The Beerbike, with a 1.50m width, allows you to consume alcoholic drinks when cycling with your friends across the many canal houses and house boats of Amsterdam. This is a unique way to get to know the beautiful city. Perfect for your bachelor party, company event or just for having fun with friends! Renting this bike means that you get a sober driver included. This is necessary to guarantee safety and makes it possible for you to explore Amsterdam when peddling and drinking. So you can have a bar experience while touring through Amsterdam! 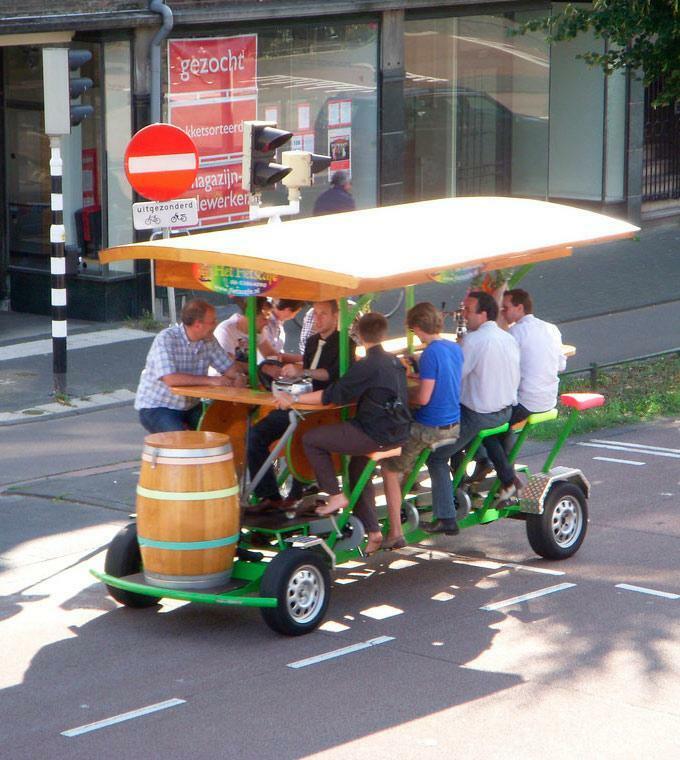 The Beerbike is suited for a maximum of 17 people and a minimum of 5 people. The tour starts and ends near Central Station (at the front of the ‘Kamer van Koophandel’ building) at the Ruijterkader 4-7. You will be able to peddle through the amazing Amsterdam streets, such as Singel, the Flowermarket, and Vijzelstraat.